A very rare trumpet form from the Yunnan in China of which not much is known other than it is found growing on grassy mountain slopes and in open woodlands and it is found in meadows in SE Yunnan at an elevation of about 3,000 to 6,500 (1000 to 2000m). 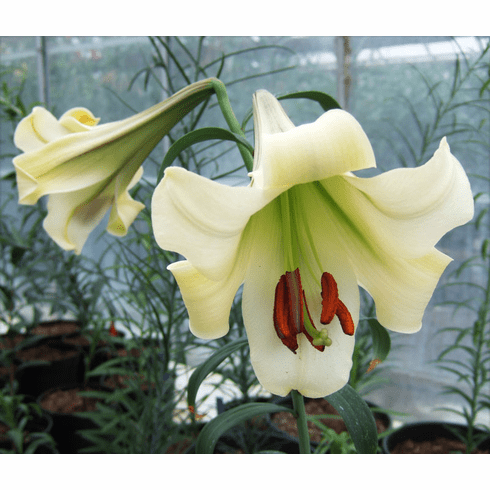 Described as being a surprisingly easy lily to grow it seems to do well in both full sun as well as partial shade and tolerates various soil conditions. Producing 1 to 6 flowers in June and July, it is very similar to L. brownii where they can be found at times growing together. The number of populations is described as "limited". From research presented by Biotaxa.org, "by demonstrating the existence of continuous morphological variation, which we observed in the field and among herbarium specimens, we treat 'L. wenshanense' as synonyms of 'L. brownii'." Though school is still out on this lovely trumpet, it might well indeed be a color variation of L. brownii. Photo and copyright Rich Hyde, all rights reserved. Used with permission. Photo inset courtesy Wikimedia Commons and was taken by John Lykkegaard. Copuright John Lykkegaard, all rights reserved. Original photo was cropped. This file is licensed under the Creative Commons Attribution-Share Alike 2.5 Generic license.